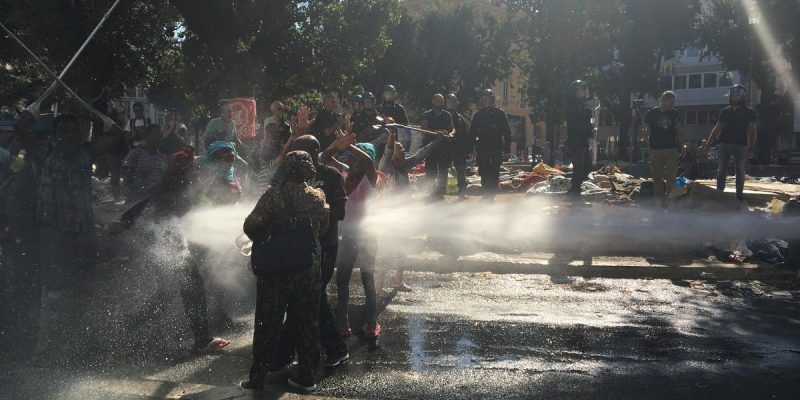 Drama unfolds in the Italian capital as Eritrean migrants and refugees, including families with children, are first evicted from an occupied building, then cleared from their makeshift camp in Piazza Indipendenza by law enforcement officers armed with water cannons and batons. What is happening in Rome, and what does it tell us on the collapse of the reception system in Italy? Also: a look at the world’s borders – out at sea, in the desert and elsewhere – to reflect on the immorality of building physical and political walls to keep migrants out of sight and out of mind. Chapter 1: on a hot August morning, at 7am, law enforcement officers entered an occupied building on via Curtatone and evicted about 800 people, all of them Eritrean or Ethiopian citizens – asylum seekers, recipients of international protection or in possession of a long term residence permit – all of whom have been in Italy for years, many of them with children. Without notice and with no alternative. See the live coverage by Eleonora Camilli (who was on the scene for the entire time) and Annalisa Camilli’s article in Internazionale. Chapter 2: left out on the streets, the occupants of via Curtatone are camped out on Piazza Indipendenza, spending a few nights outside, much to the outrage of the UNHCR while the authorities remain completely silent (the City’s offices are closed, they say, for summer holidays, and the councillor for social policy is on vacation abroad). A delegation is sent to the Capitol along with Don Mussie Zerai to ask for an alternative. Women and children are allowed to sleep in the evicted building for the night. Read the articles by Eleonora Camilli in Redattore Sociale and Leonardo Bianchi in Vice. Chapter 3: another rude awakening. Law enforcement officers in riot gear arrived again at dawn, armed with batons and hydrants: clashes ensued, resulting in the clearing of the area and a dozen injured (MSF operators who provided first aid reported fractures and wounds) and the migrants – included women and children – being taken yet again to police stations on public transport buses for photo identification. Read the articles by Annalisa Camilli in Internazionale, Angelo Romano in Valigia Blu and Luca Misculin in Il Post. The news also received international coverage, albeit with some inaccuracies, from Al Jazeera, the Guardian and the Washington Post; human rights groups have also voiced their concerns: see Human Rights Watch and Unicef. Open ending: what will happen to the refugees of via Curtatone, three times abandoned by the government? How can the authorities Rome, the only European capital without a plan for migrants, rely on evictions as their sole response? How can human rights be sacrificed on the altar of the right to security? Read Valeria Verdolini’s analysis in Che Fare and an interview. The police was still at work in Piazza Indipendenza when a picture of a police officer caressing the face of a refugee woman during the eviction. “A simple gesture that conveys humanity”, reporters and readers commented, touched. The picture, however, is not enough to hide the violence that was taking place, and it should lead us to reflect upon power and the consequences of media framing. Read the analysis by Leonardo Bianchi in Vice and a different take by Michele Smargiassi in Repubblica. “People are asking me how Eritreans can be refugees if they are not fleeing any war,” an astonished Annalisa Camilli reports in Internazionale. Following the clearing of Piazza Indipendenza, it is now imperative to read up on Eritrea, one of the world’s most repressive dictatorships, that has been dubbed “North Korea on the Red Sea”. Read the illuminating article by Alessandro Leogrande in Il Manifesto on the current situation in Eritrea and the importance of remembering Italy’s responsibilities. Also read the on the legacy of Eritreans in Italy by our own Marina Petrillo in Il Post. 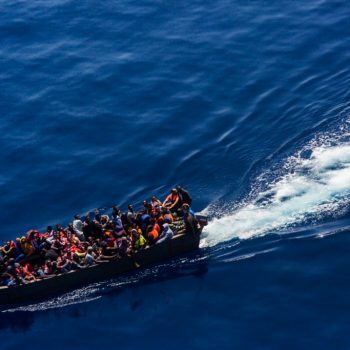 Meanwhile, the number of people arriving in Italy has been dropping over the months of July and August, and the government is celebrating the success of the “Minniti strategy”. Its plan goes well beyond the restrictions on humanitarian NGOs, and has more to do with the agreements with Libya and Egypt, and with the fact that armed groups in Libya are stopping migrants from taking to the sea (something for which Italy is also responsible). Read Francesca Mannocchi’s investigative report in Middle East Eye, the article in Channel 4 and a comprehensive summary in Il Post. A summit was held in Paris on August 28th with Germany, France and Italy with Chad, Niger and Libya to tackle the migration crisis. Italy was praised for its code of conduct for NGOs and for the agreement with Al Serraj’s government on migrant pushbacks. The joint declaration of the summit also mentions, “improving the coordination and the efficiency of rescue operations”: read the full text here. blames human trafficking exposing migrants to increasingly lethal travelling conditions, very little is being said about the EU’s political responsibilities. Read op-ed by Joe Penney in the New York Times. 6. Is Spain facing a new migration crisis? Close down a route and another will open, they say, and it is true. But can we really talk of a new migrant crisis in Spain? There has been an increase in the number of people reaching Spanish shores, but the current levels are not unprecedented, Simon McMahon explained in his in-depth analysis for The Conversation UK. Also read Saeed Kamali Dehghan’s report in the Guardian, on the migrants attempting to cross from Morocco to Spain via the Strait of Gibraltar. What will happen to the refugees on Chios? As arrivals surge again on the small Greek island (550 in August), authorities are starting to dismantle the open refugee camp of Souda, with the aim of making the official government camp of vial (inaccessible to volunteers) the only place available to refugees confined on the island. Read the report by Izzy Tomico Ellis in EU Observer. Already twice this August, the UN denounced the deaths of more than 150 adolescent migrants, thrown into the sea by people smugglers off the coasts of Yemen. What’s behind these tragedies? And why are young Somali and Ethiopian migrants still attempting to travel to the war-torn country? Read Fatima Mohie-Eldin’s analysis in Muftah. The tragedy of Syrian refugees, as told by a Syrian who has decided not to leave, even after watching all his friends and family flee, and is now living in an empty Damascus. Read this long, beautiful essay by author Khaled Khalifa in the Guardian. Trump’s plan to build a wall against Mexican migrants is not only a matter of costs, as American politicians are arguing: there’s a more serious, deeper moral issue at stake. Read the op-ed by Jillian Hernandez, Alan Aja and Raúl Carrillo in Teen Vogue – as well as Eleanor Acer’s analysis in Refugees Deeply on why the USA can no longer pretend that Mexico is a safe country.